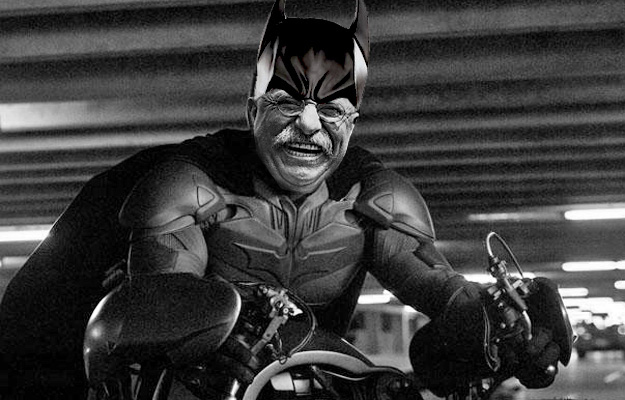 Is Theodore Roosevelt the Batman? “It takes more than that to kill the Batman!” is not an exact quote from Theodore (Teddy) Roosevelt’s campaign speech in an auditorium, soon after being shot by a would be assassin, outside a Milwaukee hotel, but it is close. Many of the details of the Batman story are, in fact, so close to the details of the former president’s story that many claim it is the inspiration for the creation of the fictional character we now call The Dark Knight. Bruce Wayne lost both of his parents before he was a teenager, and Teddy Roosevelt lost his father when he was nineteen. In H.W. Brands T.R. : The Last Romantic, Brands alludes to the fact that most young men, on the precipice of becoming adults, deify their father. If a father dies premature, as in the case of Theodore Roosevelt Sr., this deification can become locked in stone for some young men. The contrast being that no matter how great a father is, if he lives throughout their son’s maturation, that son is prone to find some weaknesses in his father’s lessons, advice, and in the man’s general arguments. This progression doesn’t necessarily say anything about either party, but it’s a natural evolution based on the experiences the young man has and some elements of rebellion. Roosevelt was not afforded such natural, mature comparisons, and that coupled with his grieving and sorrow, may have resulted in the deification of his father without objectivity. As a result, both Teddy Roosevelt and Bruce Wayne, would spend much of their trying to live up to the deified images they had of their fathers. Yet, if one were to compare the bios of these men, and their fathers, it could be said that they more than surpassed the actual accomplishments of their fathers. The point is not the line-by-line comparisons, of course, but the post-traumatic mindsets that resulted from them, and it could be said that the fictional Wayne character might never have become Batman were it not for the death of a father, and Roosevelt might never have become the president were it not for the idealized images he had of a man he spent his entire life pursuing, and never catching … in his mind of course. This post-traumatic angle of the Teddy Roosevelt story, going so far beyond surviving a tragedy, to thrive as a result of it, was so engaging to one writer, a Paul Levitz (who spent forty-two years writing for DC Comics), that he believed he could use it as a fundamental, driving force for his characters in a manner that would connect to his readers. The following was said by Theodore Roosevelt Jr., but all fans of The Dark Knight Trilogy, and Batman fans in general, could imagine Bruce Wayne saying it to his butler, Arthur, in the many shared chunks of dialogue devoted to discussions of Thomas Wayne, Bruce’s father. Theodore Roosevelt Sr. also taught Teddy that the best way to overcome the debilitating childhood illnesses that kept the young man indoors most of the time, and the best way to overcome bullies, was to strengthen his way through it. Theodore Roosevelt Sr., purchased a home gym for his son, and hired a boxing coach to teach the son how to fight, and Teddy Roosevelt would later use all of that to achieve a runner-up spot in a Harvard boxing tournament. Fans of The Dark Knight Trilogy could say that stark similarities exist between that father-to-son advice, and the resultant training scenes, in the first installment of the trilogy Batman Begins. The difference being that similar dialogue was said by the Ras al Guhl character, played by actor Liam Neeson, as opposed to Bruce Wayne’s father. *Side note: Jonathon Nolan, brother of The Dark Knight creator Christopher Nolan, and co-writer of the other two installments of The Dark Knight movies, states that the Ras al Guhl character, in the Batman Begins installment, was based on Al Qaeda leader Osama bin Laden, and the bin Laden crusade to “heal the world” through terror. It has been noted in many places that Christopher Nolan, in particular, based his The Dark Knight version of the Batman, in part, on Teddy Roosevelt. Also, as noted below, he thought that the entire Batman story was derived from Roosevelt’s biography. It was also noted, in this article, that both Nolan brothers suggested that the best way for actor Christian Bale to learn more about the Dark Knight character they drew up, was to read Edmund Morris’ biography of Theodore Roosevelt The Rise of Theodore Roosevelt before they began shooting the first installment of The Dark Knight Trilogy. Those who are familiar with the general story of the Batman will also note the importance the role of police commissioner played in the stories of the two. Teddy Roosevelt was a police commissioner that didn’t just vow to clean up the city, he went undercover, as a policeman, to see to it that his officers were doing their job in a thorough and honest manner. Bruce Wayne went more literal in his undercover status to work hand in hand with Commissioner James Gordon to clean up the city. Both men also considered it vital to their existence to have a self-appointed successor to carry on the legacy, and both were let down by that successor. Bruce Wayne was let down by Harvey Dent, and Roosevelt felt he was let down by his chosen successor, President William Howard Taft. Soon after volunteering to not seek reelection for president that would have led to him being in office for eleven years, as a result of the assassination of his predecessor, Roosevelt would learn that his chosen successor, Taft, did more than break a number of promises that he made to Roosevelt. Taft, according to Roosevelt, broke a number of campaign pledges he made to the American people, pledges that were in line with many of Roosevelt’s progressive policies. Taft replaced much of Roosevelt’s cabinet, after promising that he would not do so. Taft replaced key ambassadors with people that Roosevelt informed Taft he hated, and Taft ended up crediting his electoral victory for president to his brother, not Roosevelt, the man who had mentored him for the position. The stories of Roosevelt’s unhappiness with Taft would culminate in Roosevelt breaking his pledge not to run for president again, running against his Taft in Taft’s attempt to be re-elected, in the Republican primary, and then in a third-party of progressives, that called themselves the Bull Moose Party, in the general election. On that election trail, Roosevelt would declare that Taft was “disloyal” and a “Great pink porpoise of a man”. The latter may have been an insult directed at the much talked about weight of the man, but the former, “disloyal” part of the characterization, could be interpreted as Roosevelt saying that Taft, his successor, was two-faced. Harvey Dent, Bruce Wayne’s chosen successor became the arch-villain Two-Face. Bull Moose, Batman, the phonetics are close, but how close are they? Is it possible that co-creator Bob Kane considered making the bat man, a bull moose, to inexorably link the two and leave no mistake to the origin of Batman, or were the logistics of having a man become a bull moose too untenable even for a comic strip? Or, is this an informal fallacy, equivalent to the Texas Sharpshooter Fallacy, in which a shooter fires a number of shots into a barn and circles a target around the largest cluster of shots after the fact? Are there perceived patterns, in other words, that focus on the similarities and ignore the differences? Was the model for the creation of the Batman more personal to Bob Kane and Bill Finger, and we’ve determined those similarities mirror Roosevelt’s in so many ways that we’ve determined that he was the model? ← It’s not complicated. It’s football.